If you’ve been following this blog for a while, you know that it really doesn’t take that long for me to assess and come to a conclusion about wine. In my video reviews, you’ll see me talk about a particular wine from anywhere from five to twenty minutes… But really… It only takes me a minute or two of that tasting to form my opinion. There’s a couple of different things going on here. 1. I don’t do nearly as many written reviews on this blog as I used to. Go ahead and take a peek at the last ten posts. I’ll wait… Do you see that? Nine of the last ten reviews I did on this site were of the video variety! The reality is, aside from the technical aspects, video wine reviews are easier… for me anyway. That’s one of the major reasons why I do them. 2. When I do a written piece on this site, I want there to be a theme that ties everything together. The problem that I’ve been having with this review is that there are too many themes that I wish to include. Every time I started to write about this wine from one particular angle, a new theme would surface, and stuff would start to get all confusing. A. Chris Missick of Villa Bellangelo approached me about reviewing some of his wines near the end of June. B. Six samples from Villa Bellangelo arrived at my doorstep at the beginning of July. C. Hella Villa Bellangelo Samples now inhabit my refrigerator. D. As you can see from the photo above, Villa Bellangelo specializes in cool-climate Riesling and Gewürztraminer from the Finger Lakes AVA of upstate New York. E. While I’ve been very much aware of the style of the Finger Lakes region, I’ve never had any wines from this area. My experience as a Californian has been that one must really search to find these wines around here. F. Days after the samples arrived, Kara and I drove down to Santa Barbara County to attend the 2014 Wine Bloggers Conference. We had a blast! G. I learned at the Wine Bloggers Conference that the expression “We had a blast!” is mad cliché, and should never be used. H. On the final night of the Wine Bloggers Conference, the announcement was made that next year’s conference will be held in the Finger Lakes. I. Since returning to from #WBC14, I’ve been attempting write a post which makes a connection between my experiences at the conference with the wines of Villa Bellangelo (and all the other #FLXWine). Let’s give this a go. On the opening day of the Wine Bloggers Conference, the keynote speech was delivered by Corbett Barr of Fizzle. While not an expert at wine blogging, specifically, Corbett has made a very good living for himself as a blogger and podcaster. I truly appreciated his take on the state of wine blogging. Corbett is a fantastic storyteller. One of the most memorable bits that I took away from his speech was when he talked about doing research on wine blogging. Corbett talked the time he took a bottle of wine down to a park, drank it, and tried to blog. He summed up his experience with the following equation. I totally get what Corbett was saying here. There is a whole lot more to this art form (That’s right! I went there!). You can’t just throw some booze in your glass and fake it… though some may try. Sometimes you get stuck. Seriously… It’s been 720 words in this post so far, and I still haven’t gotten to reviewing this Gewürztraminer. In some ways, I feel like the 2012 Semi-Dry Riesling is a better wine to start with, if wanted to explore the wines of the Finger Lakes. As wine drinkers, we should all be familiar with Riesling. 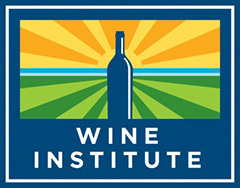 Now… whereas many wine lovers will geek out over all things Riesling, the typical wine drinker may stay away from it. Many complain that Riesling is too sweet. This may be due to the typical, almost dessert-like, domestic Riesling. In such cases, these Rieslings are too sweet because they are grown in the wrong place, or just made poorly. When one explores the killer, cool-climate Rieslings of Alsace, France or Germany, one can really get a firm grasp of all that Riesling really has to offer. High acid. A touch of residual sugar. Balance. They’re hecka tasty. My hope is that the Finger Lakes show more like European Riesling versus their domestic contemporaries. Let’s try the 2012 Semi-Dry Riesling! Color: Light golden-yellow. One swirl of the wine in the glass not only highlights the typical color, but also fades to this beautiful slow sloshing of the juice, highlighting its viscosity. Nose: I love the typical oily notes that can be found in good Riesling. This wine is no exception. I am also noticing a touch of lemon and savory herbs. Palate: Nice tart lemon on the front of the palate are rounded out by those oily notes. There is a touch of residual sugar (1.8%), but the 7.95 g/L of titratable acidity provides the balance that Riesling needs. You would never characterize this wine as being too sweet. Score: The 2012 Semi-Dry Riesling is from the Morris and Gibson vineyards in the Finger Lakes. I’m excited to see how this wine stacks up against some of the single-vineyard offerings from Villa Bellangelo. This is a fresh and balanced number. The perfect wine for a summer day when you’re in a blogging rut. 90 points! Now let’s get back to the Bellangelo 2012 Gewürztraminer that I tasted last week! Color: Pale golden-yellow. Very similar to the Riesling (minus the sloshiness of the swirl, of course). Nose: Honey and lemon zest dominate this nose, but there is an oiliness here (reminiscent of the Riesling). Palate: This wine has weight. There is a very viscous, oily palate. Good notes of honeysuckle. There is a hint of sweetness (1% residual sugar) here. This Gewürztraminer is Riesling-like, but with much less of an acidic backbone (5.4 g/L TA). Score: This wine is pretty. While easy-drinking, there is a nice floral complexity to this. This wine was also grown from the Morris and Gibson vineyards in the same year as the Riesling. It’s nice to see how similar these two varieties can be when one strips away virtually all the other variables that could exist from one bottle to the next. This is a tasty 89er. 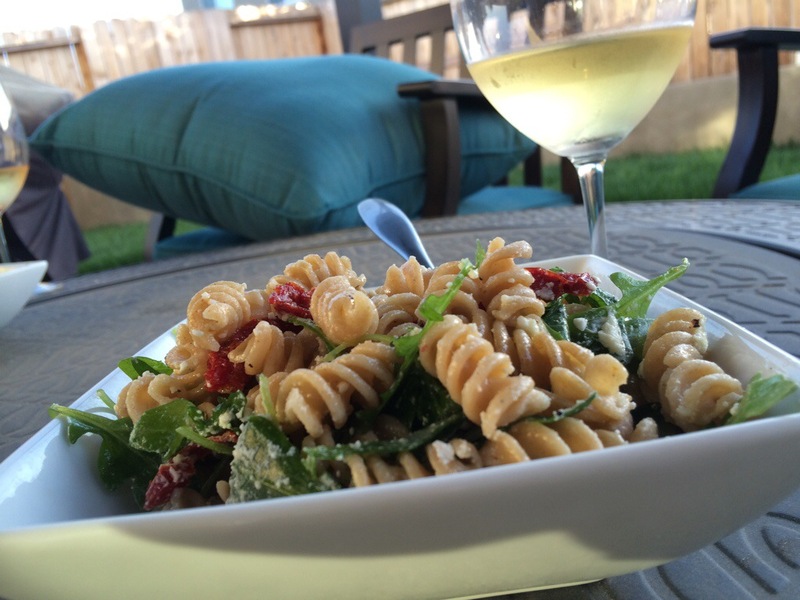 The Gewürztraminer was paired with Kara’s Pasta Salad of Fusilli with Arugula, Goat Cheese, and Sun-Dried Tomatoes. I’m a big fan of both of these wines from Villa Bellangelo. The acid (more so from the Riesling) provides a versatility in food pairings. The sugar gives them both a pleasant sweetness, without making them overly goopy. Try them with any food you like… I really don’t think you could go wrong with anything here. This is #FLXWine to the fullest! What’s your favorite wine from the Finger Lakes? Leave a comment, and let us know what you think.